Butler’s Center for Urban Ecology (CUE) has been awarded a three-year, nearly $300,000 grant from the National Science Foundation to establish the CUE Farm on campus as a hub for undergraduate education and research. The money will support Butler faculty in the development and implementation of four urban agriculture research modules in biology, chemistry, ecology, and environmental science courses and to study the impact of those modules on student learning. Faculty participants are Travis Ryan, Sean Berthrong, Elizabeth Davis, Jesse van Gerven, and Rasitha Jayasekare. Brandon Sorge and Grant Fore from the STEM Education and Innovation Research Institute at IUPUI will be leading the education research. -Four courses that teach core disciplinary concepts through place-based experiential learning in the context of urban agriculture. 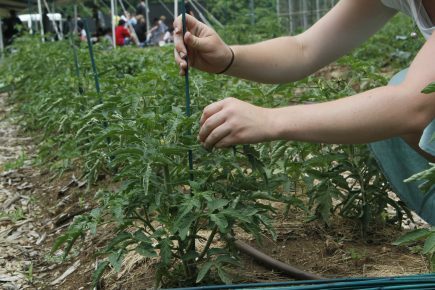 Students will first learn about a core disciplinary topic (e.g, soil respiration and arthropod diversity in the BI230 Ecology & Evolutionary Biology ­­– Fundamentals course) and will then be introduced to the social and ecological impacts of urban agriculture and how the class topic impacts food production. Students will then conduct real research in the topic area by developing research questions and collecting, analyzing, and presenting data that will be used by faculty for scientific publications. By tying course concepts to their impact on the urban food system, students may be better informed and inspired to make more sustainable food choices. -Published research on whether these modules were effective in increasing student scientific literacy and civic mindedness. By integrating the CUE Farm into the curriculum, the University will be eligible for up to $3.6 million in funding in future years. That money would go toward developing modules in courses spanning every college on campus and then bringing this approach to other universities. Opportunities to partner with Butler University in support of the Center for Urban Ecology, the Farm, and its community programs are available. To learn more, please contact the Office of Corporate and Foundation Relations at cfr@butler.edu. This project is focused on making the CUE Farm even more of an asset to campus by tying it to the curriculum. In acknowledgement of his lifetime of service to the Church and the Holy Land, Father Thomas A. Baima ’76 was presented with the Gold Palm of Jerusalem, the highest distinguished service award of the Equestrian Order of the Holy Sepulchre, an international order of the Vatican that serves the Holy Land, on October 21 at Saint John the Evangelist Church in Indianapolis. Baima’s activities on behalf of the Holy Land stretch back to the 1980s. As an ecumenical officer, he worked extensively with Eastern Christian, Muslim and Jewish Communities. His connection to the Middle East began with work with the Melkite Catholic Church and the Arab Christian community in Chicago. He worked ecumenically with the Armenian Church, one of the major Christian communions of the Holy Land. He planned and managed Joseph Cardinal Bernardin’s historic Dialogue Visit to Israel, the West Bank and Gaza with leadership of the Catholic/Jewish Dialogue in Chicago. He accompanied Cardinal Bernardin in meetings with numerous dignitaries, including presidents, prime ministers, the foreign minister of the State of Israel, the president of the Palestinian Authority, the chief rabbi of Israel, and others. He worked with Francis Cardinal George and the Jewish Federation of Metropolitan Chicago to create the Fassouta Project, which raised $100,000 to create a computer literacy center in the all-Christian village of Fassouta in northern Israel as a demonstration project to call attention to the problem of Christian emigration. Baima is a priest of the Archdiocese of Chicago. He currently serves as Vice Rector for Academic Affairs of the University of Saint Mary of the Lake, where he is a full professor of dogmatic theology and Vicar for Ecumenical and Interreligious Affairs of the Archdiocese of Chicago. He studied Philosophy and Religion at Butler and has served on the Board of Visitors of the College of Liberal Arts and Sciences and on the Advisory Board of the Center for Faith and Vocation. 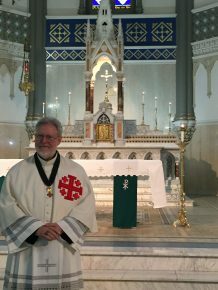 The author of six books, and an internationally recognized expert in the promotion of Christian unity and interreligious dialogue, Father Baima serves on two Vatican dialogue commissions, the dialogue of fraternity and service with the Buddhists and the theological dialogue with the Assyrian Church of the East. Nationally, he is a member of the Catholic-Muslim Consultation for the United States Conference of Catholic Bishops. Baima’s activities on behalf of the Holy Land stretch back to the 1980s. Investigating the Rubik’s cube, comparing contracts for restricted free agents in the NBA, and constructing Cantor polynomials—those were just some of the research projects Butler students undertook during this year’s Mathematics Research Camp, an eight-day intensive experience designed to introduce students to mathematical research. From Monday, August 8, through Monday, August 15, 14 Butler Math and Actuarial Sciences students spent the week on campus working on math problems suggested by faculty mentors. On the first day, faculty mentors gave quick presentations about different, unsolved math problems they thought the students would be interested in trying to solve. The students selected their problem and faculty member to work with, then spent the week working on calculations and preparing a poster explaining their results. They displayed the results of their work during a poster session August 15 in Jordan Hall Room 236. Johnston said the students, rising sophomores to rising seniors, will continue to do research with their faculty mentors throughout the 2016-2017 academic year. 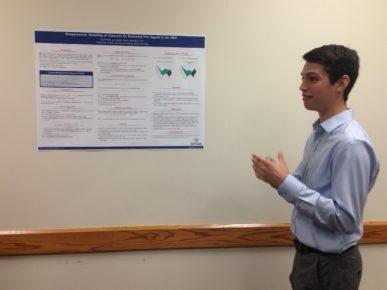 “We think every single one of these students has significant results that we’re encouraging them to go to research conferences to present and certainly at Butler’s Undergraduate Research Conference,” he said. Highland Park, Illinois, senior Guy Preskill, who looked at the contracts of NBA restricted free agents, appreciated the opportunity. “I had a lot of hours to work on this, and I had a lot of attention from my adviser, Dr. (Rasitha) Jayasekare, which is great,” he said. 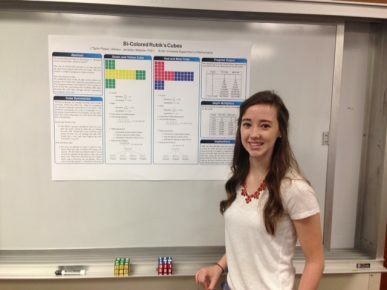 Taylor Pieper, a senior from Greenwood, Indiana, said her work on the Rubik’s cube, taught her a lot about group theory and also provided her with a crash course in computer programming that she used on her calculations. Also participating in the weeklong camp were Butler students Sam Turley (Whiteland, Indiana), Sam Good (Indianapolis), Lauren Briskey (Avon, Indiana), Micah Brame (Libertyville, Illinois), Anthony Gurovski (Libertyville, Illinois), Lucas La Rosa (Indianapolis), Ellie Demuth (Goshen, Kentucky), Rosa Florence (Springfield, Illinois), Mario Guzman (Plainfield, Illinois), Zak Morgan (Cicero, Indiana), and Alex Glickfield (Greentown, Indiana). They were mentored by Johnston, the department chair, and faculty members Chris Wilson, Prem Sharma, Jonathan Webster, Becky Wahl, Amber Russell, Rasitha Jayasekare, Scott Kaschner, and John Herr. Johnston said he was pleasantly surprised by the work that came out of this third-annual camp. 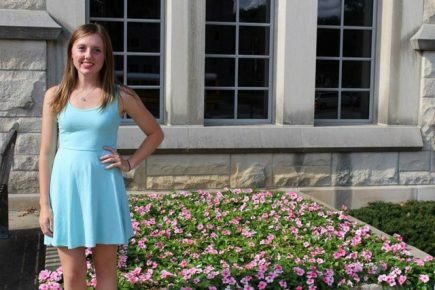 Junior Political Science/International Studies major Emilie Turner likes to learn about different cultures, and this summer she’ll get a chance to do just that as a participant in the prestigious Fulbright Summer Institute in Wales. Turner, who’s from Fishers, Indiana, will spend June 25 to August 6 at three internationally renowned Welsh universities, Cardiff University, Bangor University, and Aberystwyth University, focusing on the theme of contemporary Wales: industry, politics, culture, and change. She also will explore the geography, culture, heritage, and history of Wales by visiting museums, galleries, parks, castles, and islands. The US-UK Fulbright Commission selects participants through a rigorous application and interview process. In making these awards the Commission looks not only for academic excellence but a focused application, a range of extracurricular and community activities, demonstrated ambassadorial skills, a desire to further the Fulbright Program and a plan to give back to the recipient’s home country upon returning. The Commission is part of the Fulbright program conceived by Senator J William Fulbright in the aftermath of World War II to promote leadership, learning and empathy between nations through educational exchange. Award recipients and summer program participants will be the future leaders for tomorrow and support the ‘special relationship’ between the United States and United Kingdom. Fulbright Summer Institutes cover all participant costs. In addition, Fulbright summer participants receive a distinctive support and cultural education program including visa processing, a comprehensive pre-departure orientation, enrichment opportunities in country, a re-entry session and opportunity to join its alumni networks. Turner, who participants in service projects through the Intercollegiate YMCA and Blue Key Honor Society, plans to go to law school and possibly go into international law.